The driver air bag module is dual stage and is wired to the air bag diagnosis sensor unit through the spiral cable. The air bag diagnosis sensor unit will monitor for opens and shorts in detected lines to the driver air bag module including the spiral cable. Is the DTC detected? YES (Current DTC)>>Refer to SRC-46, "Diagnosis Procedure". NO >> Refer to SRC-46, "Diagnosis Procedure". Is the DTC detected? YES >> Refer to SRC-46, "Diagnosis Procedure". Disconnect driver air bag module harness connectors and spiral cable harness connector. 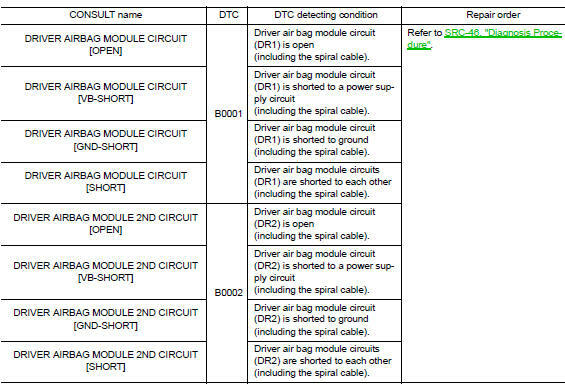 Check continuity between driver air bag module harness connector and spiral cable connector. Check continuity between driver air bag module harness connector and ground. NO >> Replace the spiral cable. Refer to SR-16, "Removal and Installation". Replace the driver air bag module. Refer to SR-12, "Removal and Installation". Is DTC still current? YES >> GO TO 8.